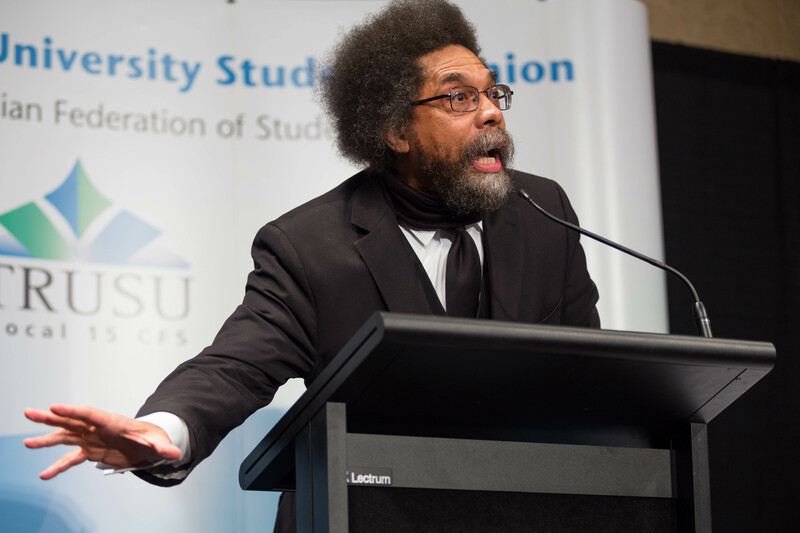 “How are you going to live, from womb to tomb?” Cornel West asked the packed Grand Hall on Thursday, Jan. 28. West’s talk focused on the value of education, but not necessarily as it is traditionally discussed. He explained the importance of personal growth and awareness of the human condition as one of the most valuable outcomes of higher education. 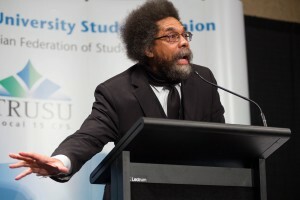 During his impassioned speech, West drove home the act of expanding one’s mind during post-secondary and study of the arts as the “real value of being human.” He explained the purpose of education as a means to prepare oneself for the battle against the endless social imbalances in the world. In a world where “everything is for sale and everyone is for sale,” West explained the necessity of critical thinking and thoughtful action as the most logical weapon against social injustices. West is a self-proclaimed advocate for the working class and spoke out against the imbalances and racism embedded in the criminal justice system. Most of his expertise is in the policies and laws of the United States and he wasn’t afraid to criticize actions and inactions of President Obama. West wove together strong themes of patriarchy, colonialism, love, compassion, social injustice and capitalism using vivid analogies and metaphors. The audience hung on his every word and a few times people shouted out in agreement. West’s vibrant speech was matched with wild gestures and a level of unbelievable intensity. 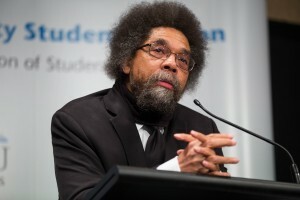 During the Q&A session, an audience member said that West’s speech would remain etched in his mind as one of the most influential and important moments of his life. West, touched by the kind sentiment, left the podium, ran over and embraced the young man. Education providing a path to self-awareness, examination and actualization as an avenue leading to growth was a memorable point for many. “[I thought about] the importance of compassion and loving yourself. We think that prejudice is something that we can just remove from ourselves. Each of us has prejudices inside us. He talked a lot about recognizing and confronting it using that to change yourself,” said fourth-year sociology student Kenna Sim. He ended his talk by asking Canada to “address the vicious cycle of white supremacy vis-a-vis indigenous people,” and that all lives matter regardless of skin colour. Whether or not everyone agreed with the polarizing and political issues West addressed with his passionate speaking style, he succeeded in getting the audience to consider how they are living their lives and what, if anything, they are doing to help their fellow man.